It isn’t often that you get the chance to share two of your passions in life with an audience of thousands. For longtime University of Saskatchewan Huskies football supporter David Dubé, Friday night is one of those rare occasions: an opportunity to combine his love of the Huskies with his deep respect for the troops. 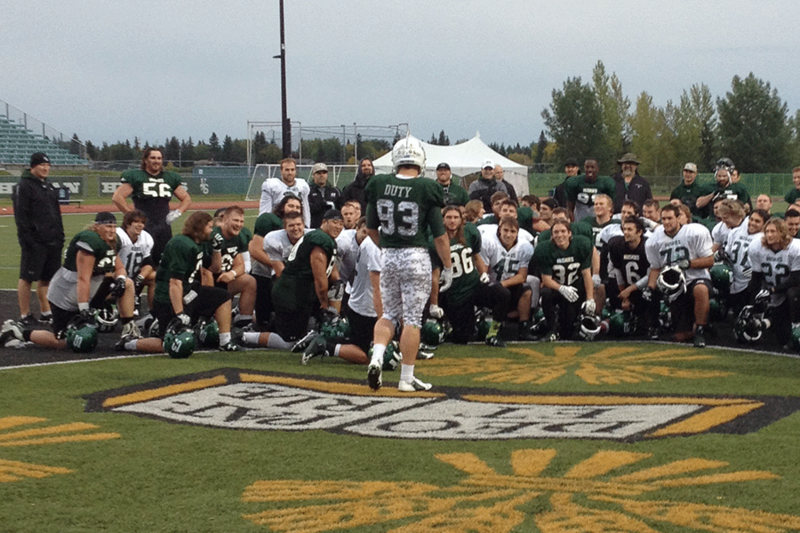 The successful local businessman, philanthropist and former U of S football player is the driving force behind the Huskies' sixth annual ‘Support Our Troops' game, as the men and women who proudly serve in the Canadian Armed Forces are honoured at Griffiths Stadium in PotashCorp Park. "I consider it a tremendous privilege to be able to contribute in this way and to do something that I have a passion for, and truth be told, the entire community has a passion for this," said Dubé, who also serves on the U of S Board of Governors. "It's usually one of our best-attended games of the year and people love the opportunity, which they don't get every day, to see our soldiers in uniform with their families enjoying themselves and to be able to walk up to them and thank them for what they do." Members of the military will be honoured prior to tonight's matchup between the Huskies and the Regina Rams, one of the highlight games of the year for these two Canada West conference rivals. But for Dubé, it's also a time for perspective and to pay tribute to the troops. "In sports we use war analogies way too often and I think for these young men to realize that as hard as they are working and everything that they are doing on the field, they're not the real warriors," said Dubé. "It's a good life lesson." The Huskies will once again don custom-designed camouflage uniforms for Friday's game, courtesy of Dubé and his wife Heather Ryan, who have also committed to topping up donations at the game up to $25,000 for the Soldier On Fund that provides financial aid to injured and ill military members. This year's uniforms will feature an Arctic camouflage colour scheme of grey and white combined with Huskies green, a change from the desert camouflage that U of S players wore in the first tribute game six years ago. "Our first uniform was an arid camo, which was one used in Afghanistan when our troops were deployed there and most of our troops are home now, so we wanted to do something a little different this year," said Dubé. "We forget that our longest border is our northern border, so this year's uniform design is based on an Arctic camo pattern. And anyone who is following the news knows there are a lot of land claims going on up north from other countries, including Russia. So that is our biggest border and it's very important to our country." Huskie helmets will also carry insignias of the army, navy and air force, and feature the crests of HMCS Saskatoon – a coastal defence vessel that recently returned from patrol in the Arctic – and HMCS Unicorn – Saskatoon's reserve division of the Royal Canadian Navy – as well as the North Saskatchewan Regiment shield. "On the back of each helmet, we have a number of local regiments and the goal was to personalize it so that each guy understands that it's not just a fancy helmet and uniform, they are representing actual people from the military in our community," said Dubé. Hundreds of soldiers and their families will receive free tickets and food vouchers for the game. Huskies fans will have an opportunity mix and mingle with local members of the military during the pre-game barbecue that begins at 5 pm in the Wyant Group Rally Alley. The pre-game ceremony at 7 pm will feature a military colour guard, a moment of silence, a fly-over by Canadian air force jets, and a ceremonial coin toss and kickoff, before the Huskies and Rams take centre stage. "We've got a bunch of great Huskie alums and their families and they love being able to cook and serve the troops and they always come back to do this, so it has kind of created a great tradition," said Dubé. "I am pleased that we have the means and the ability to do it, but a lot of people contribute to it in a lot of different ways. It's just a great way for us to able to say thank you to the troops."